Septic tank work is complicated and can even be dangerous. Fortunately, you don’t have to inspect and clean your own septic tank. You can rely on the professionals at Ardalta Vacuum Truck Services Ltd.
We don’t just offer septic system maintenance. We also repair and maintain sewage holding tanks, sump pits, and water systems. We’ve served Edmonton, Alberta since 1985, and we look forward to offering you any of the septic services you require. How often should you get your septic tank pumped? It depends on its size and the size of your family, but in general a 1500-gallon tank needs pumping about every two years. To ensure your septic system continues to function without problems, Ardalta technicians can provide regular cleaning and inspection. 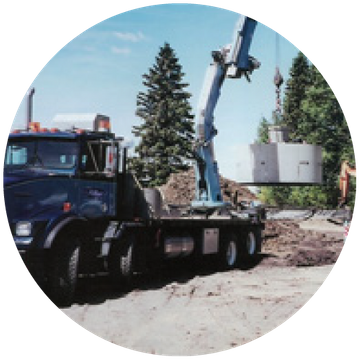 As part of our septic system maintenance in Edmonton, AB, we repair and replace your disposal systems and pumps if necessary. Since sewage holding tanks don’t release sewage on the ground like septic tanks do, they need more frequent maintenance. Our industrial vacuum trucks pump holding tanks at office trailers, commercial trailers, lake lots, and other locations. If you own a car wash, cleaning your pits is likely your least favourite job. We can take care of everything by cleaning car wash pits and sump pits and disposing of the waste at professional facilities. If you’re considering a water system at your home, property, or business, rely on us to install water cisterns. These cisterns include high-tech pressure systems along with pumps and tanks manufactured right here in Edmonton, Alberta. They’re available from 1500 to 5000 gallons and carry a 20-year warranty. Call us today at 780-922-2750 for septic system maintenance or any other service you need. Need your sewage holding tank pumped?